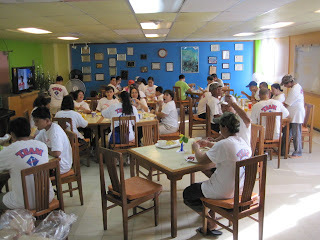 On October 22, 2011, the staff, family and friends of both Fiesta Resort and Spa and Saipan Grand Hotel went to Mt. Tapochau to clean the area. Thirty-seven (37) volunteers braved driving the bad roads going up and collected 30 bags with approximate weight of 150 lbs. We removed unwanted weeds and grass, and cleaned the steps. The volunteers were treated scrumptious breakfast at Shirley's Café. Fiesta Resort & Spa and Saipan Grand Hotel are members of MINA. Earlier this year the Northern Mariana Islands kicked off a global rush of shark conservation by banning the sale, trade, and possession of shark fin. 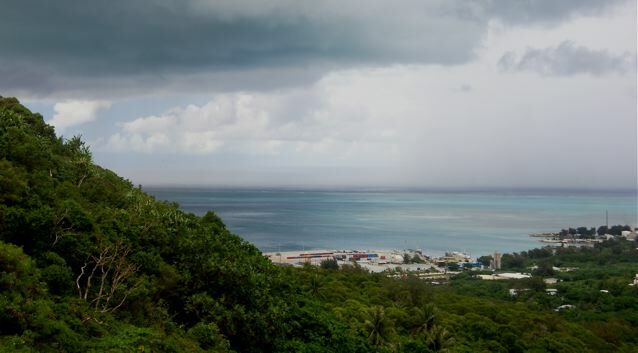 Since the day Governor Fitial signed Public Law 17-27 into law, leaders in Guam, Honduras, The Bahamas, Chile, Tokelau, and the Marshall Islands have passed shark conservation measures. 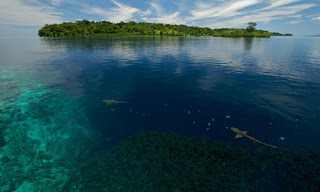 Additionally, Governor Fitial championed the declaration of the Micronesia Regional Shark Sanctuary, the first multi-jurisdictional shark sanctuary in the world. I started a petition on the White House’s We The People website asking the Obama Administration to “ban the sale, trade, and possession of shark and shark products, including shark fin.” The petition needs about 1600 more signatures for the Administration to issue an official response. Please take a few moments to sign. The Northern Marianas is a global leader in marine and shark conservation. Like the students from San Vicente elementary who helped support the passage of our shark protections, these protections should spread from island to island, from country to country. The United States should be the next country to protect sharks. 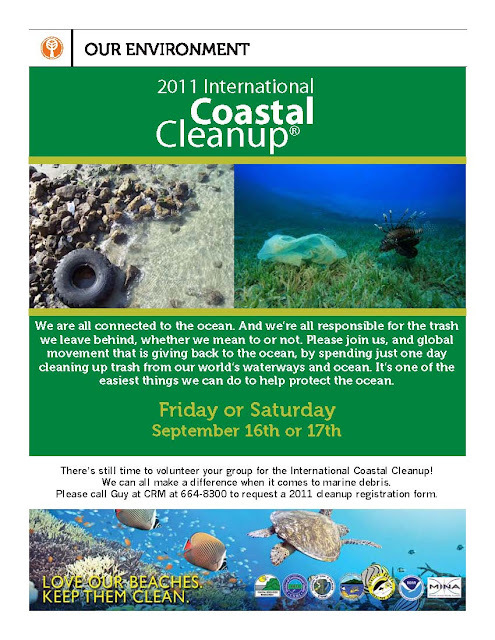 On behalf of Coastal Resources Management Office, I would like to personally thank you all group coordinators for organizing a group of volunteer to make 2011 International Coastal Cleanup a success. 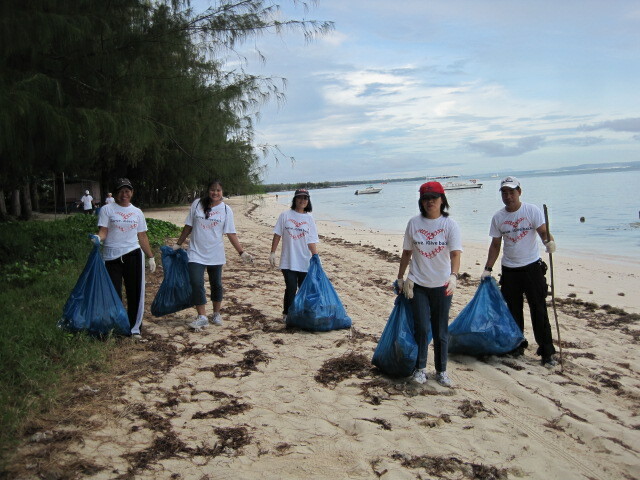 This event could not have been a success without the help of you and the many other volunteers who donated their time in making Saipan's beaches clean. 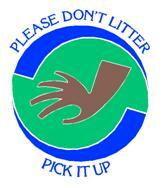 We are happy to share the result with you, the total weigh in of trash collected in our cleanup is 5,120 lbs. at about several hundred pounds less than last year. Even though it rain on us we still manage to cover most of our beaches. A lot of your data card have been turn in and received and have totaled each individual trash collected on the list. On top of our list is cigarettes filters with 2,349 pieces, second we have caps and lids at 1,198 pieces and on third of our list is plastic forks, knives and spoon and Styrofoam cups and plates at 825 pieces. I am still collecting data cards, please do send me through e-mail or stop by CRMO to drop off. I also like to thank Beautify CNMI!, DEQ, DPW, and MINA in providing helping hands and supplies for this year's International Coastal Cleanup. Summary of data card and photos will be attach. 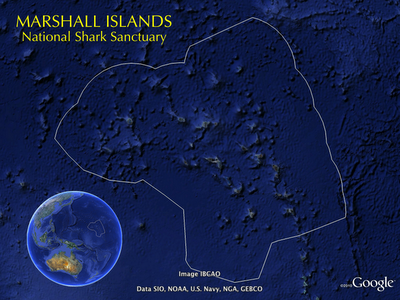 The Marshall Islands declared the world's largest shark sanctuary. 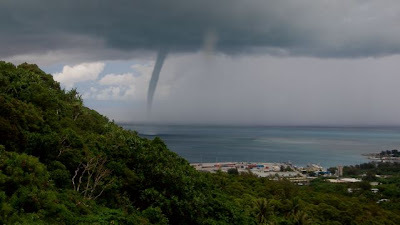 Congratulations and thank you to the people and government of the Marshall Islands. And it is time for the United States to do something similar. Shark Defenders started a petition on the Obama White House website that calls for a "ban the sale, trade, and possession of shark and shark products, including shark fin." As of this writing it needs 1,800 more signatures to reach the level that will guarantee a response from the president. On September 17, 2011, the staff and management of Saipan Grand Hotel participated in the early morning hours at around 8:30 am by commencing with the clean up from Saipan Grand Hotel towards the traffic light by cleaning on both side of the main highway with a total of 22 participants with additional 5 kids. Once at the traffic section, the cleaning proceeded towards the Sugar Dock and then headed North on the shoreline towards Saipan Grand Hotel. The clean up took about one hour and 30 minutes with a total of approximately between 150 to 200 lbs of trashes collected. The trashes were piled at the South side of the hotel and CRM staff failed to pick up the trashes after they were informed through the application form. 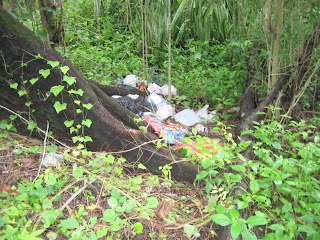 Pictures of the trashes were provided to CRM for their reference and also they were informed that they failed to pick up the trashes. After a week, our Engineering disposed the trashes. 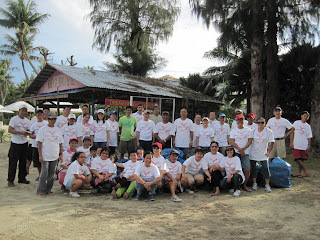 Internatio​nal Golf Academy & Preparator​y School @ LaoLao Donates Trash Gripper Tools to Beautify CNMI! 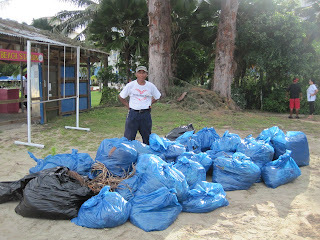 Thanks to the generous support and donation of International Golf Academy & Preparatory School @ LaoLao, Beautify CNMI! was able to donate 24 aluminum trash pick-up grippers to Kagman Komunidat Association. Daniel Huh, the new president of Kagman Komunidat Association, accepted the donated tools. These trash-gripper tools will aid the Association and student volunteers from Kagman High School in their on-going efforts to keep Kagman and the CNMI! clean and beautiful. 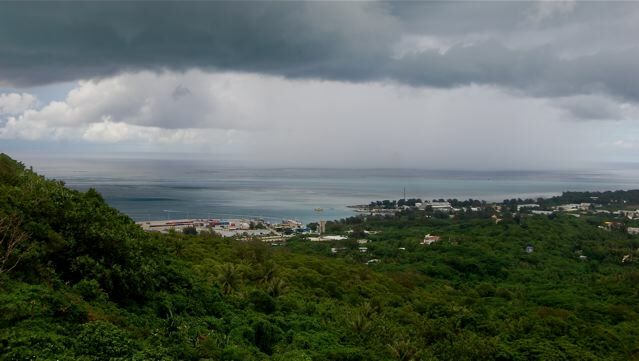 "I have been following Beautify CNMI! 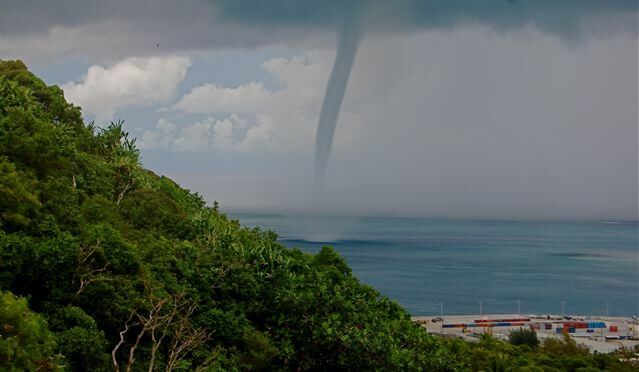 on-line for the past couple years before I moved to Saipan a year ago," said Gary Liddle, Director/Headmaster of International Golf Academy & Preparatory School @ LaoLao. 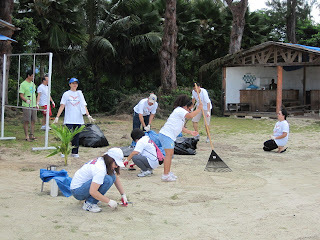 "I appreciate going to clean beaches and living in a clean environment," he continued. Liddle shared that he even picks up trash on his way to and from work. 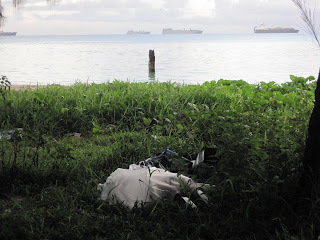 Beautify CNMI! continues to succeed because of the on-going collaborative partnerships between the private-sector, the community volunteers and the government. Thank you, International Golf Academy & Preparatory School @ LaoLao and thank you to all the hardworking volunteers in our community! Gary Liddle, Director/Headmaster of International Golf Academy & Preparatory School @ LaoLao. Shark Defenders created a new petition on We the People, a new feature on WhiteHouse.gov, and they are asking for your support. Will you add your name? If this petition gets 5,000 signatures by October 22, 2011, the White House will review it and respond! One third of all shark species are threatened or near threatened with extinction.To reverse this trend, the USA must be a leader in protecting these important predators.The Administration has championed international agreements and signed the Shark Conservation Act, but this only mandates how a shark is killed, not how many. On average, the USA lands 30,000 tons of shark per year. Palau, Maldives, Honduras, Bahamas, and Tokelau have declared national shark sanctuaries, banning the commercial fishing of sharks in their waters and ending the shark trade. Domestically, laws have been passed banning the sale, trade, and possession of shark in Hawaii, Washington, Oregon, California, and the territories of Guam and Northern Marianas. 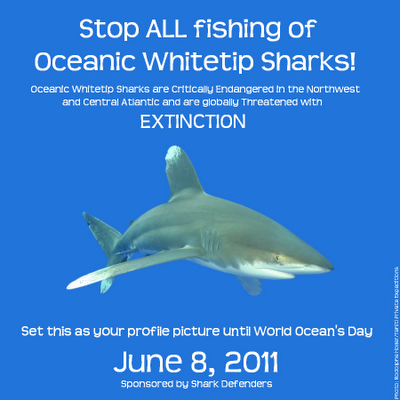 The USA should implement a national shark and shark fin ban. 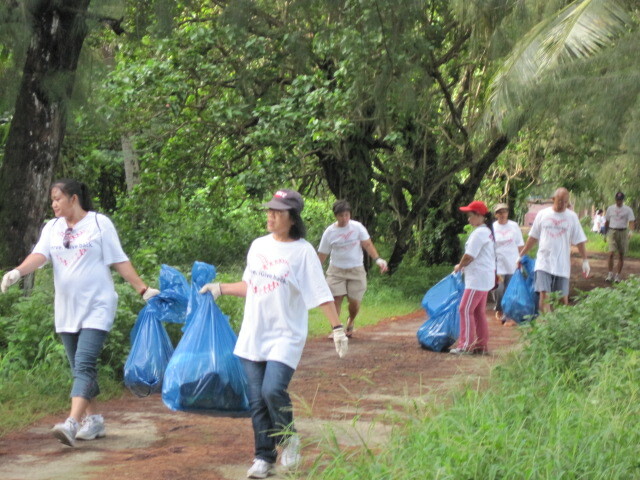 A total of 4,940 lbs of trash were collected during this year's International Coastal Cleanup held Friday and Saturday throughout several beaches and coastal locations on island. Guy Macaranas, Coastal Resources Management's 2011 Coastal Cleanup coordinator, said the trash collection for this year's cleanup is lower compared to last year's, which totaled over 6,000 lbs. 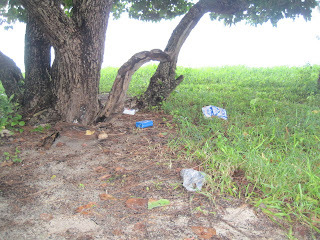 “This is good because it means that more and more people are picking up after themselves when they go to the beach and hold parties,” Macaranas told Saipan Tribune. Macaranas disclosed that based on the data sheets they collected from the volunteers who participated in the cleanup, cigarette butts comprised the biggest number of trash at 1,601 pieces. Other items collected include plastic and glass bottles, beverage cans, plastic spoons and forks, and Styrofoam plates. This year's cleanup had 29 volunteer groups: the Saipan Rotary Club, McDonald's, Tan Holdings, CTSI Logistics, Fiesta Resort, Hyatt, Saipan Grand, PDM Promoters, Winzler & Kelly, Lions Club, Pacific Islands Club, Northern Marianas College, Phi Theta Kappa, NMC Upward Bound Program, U.S. Coast Guard, Saipan Mayor's Office, Saipan International School, Marianas Visitors Authority with the NMI Diving Operators Association, Marianas Waterworks Corp., Hard Rock Café, Mt. Carmel High School Red Cross Honor Society Club, Marianas Baptist Academy, Church of Jesus Christ of Latter-Day Saints, Seventh-Day Adventist, Team Yalaka, POI Aviation, Department of Public Lands, Division of Environmental Quality, and the Commonwealth Utilities Corp.
Macaranas noted that the islands of Tinian and Rota had their own coastal cleanups, in coordination with the CRM's field offices and mayor's offices. Rota's cleanup was held Monday while Tinian will hold it on Thursday. According to Macaranas, the annual cleanup, held simultaneously in different coastlines around the globe, also forms part of CRM's ongoing Clean Beaches Campaign, which aims to encourage and educate the community about caring for the islands' beaches and marine resources. Macaranas emphasized that more work needs to be done to educate the community and remind them that “they know better” in terms of caring for the environment. “If we keep doing these cleanups and educational campaigns, we would have a better tomorrow,” he added. Joining in International Coastal Clean Up Day, 35 volunteers cleaned Makaka beach and a part of Beach Road and collected 35 bags of trash weighing approximately 175 lbs. We also did our usual calisthenics and enjoyed a scrumptious breakfast courtesy of Fiesta Resort & Spa Saipan. The Adopt-A-Pavilion team of 26 covered the coastal/shorelines of 13 Fishermen to Garapan Fishing base and were able to gather a total of 20 bags or approximately 100 lbs of trash. A September birthday bash followed after the clean-up! Our total group (after stragglers arrived) was about 25 people, including staff from McDonalds. We started a little after 8am and stopped around 9:30am due to the major downpour of rain. Afterwards, we gathered in the tented area and counted our collections for reporting to the CRM and Ocean Conservancy. All in all, we collected approximately 40 bags of trash, which consisted mostly of bits of plastic bags and wrappers, cans, bottles, caps, cigarette butts, batteries, diapers and carry away food service items (cups, forks, spoons, etc). Additionally, we discussed making a request once again to move the Rotary recycling bin back to its original location under the big pine tree nearest the road going in and out of the area for higher visibility and, hopefully, more usage. First Friday Films Celebrates National Arts and Humanities Month in October featuring The Navigators: Pathfinders of the Pacific playing at 6:30 p.m. on October 7, 2011 at American Memorial Park. Over 1,000 years ago, the islands of Polynesia were explored and settled by navigators who used only the waves, the stars, and the flights of birds for guidance. In hand-built, double-hulled canoes sixty feet long, the ancestors of today's Polynesians sailed across a vast ocean area, larger than Europe and North America combined. To explore this ancient navigational heritage, anthropologist/filmmaker Sanford Low visited the tiny coral atoll of Satawal in Micronesia's remote Caroline Islands. 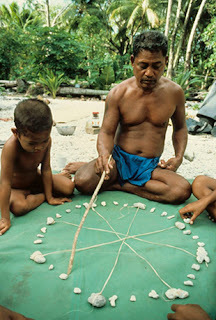 The Navigators reveals the subtleties of this sea science, transmitted in part through a ceremony known as "unfolding the mat," in which 32 lumps of coral are arranged in a circle to represent the points of the "star compass." To master the lore of navigation was to attain great status in traditional Micronesian society. This special event is brought to you by the NMI Council for the Humanities, the Tan Siu Lin Foundation, the Division of Environmental Quality and the National Park Service. 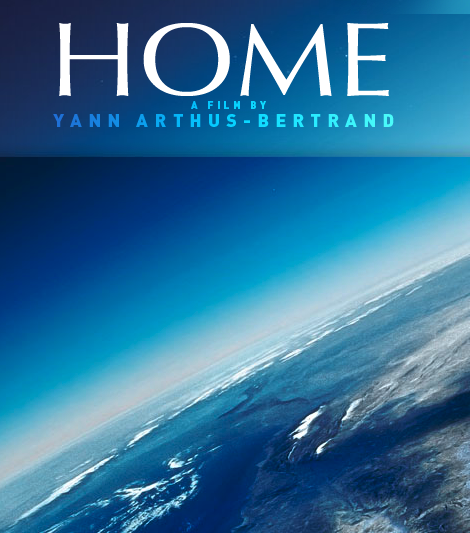 Tomorrow, August 5, First Friday Films will be screening Home, a film that exposes the impacts of mankind’s actions on our planet Earth. With breathtaking visuals taken from an aerial perspective, we can take a look down on what has become of Earth and what we can do to save it from the threats of global warming. The journey starts at 6:30 PM at the American Memorial Park Visitor's Center. There is no place like home—and that is especially true when “home” refers to our planet. With stunning shots from over fifty countries, Home presents what Time magazine hails as “an intoxicating perspective on our world” showcasing the majestic beauty of the planet as well as the undeniable tragedy that we have caused it. Director Yann Arthus-Bertrand hopes that with this stark presentation of Earth, the film will resonate in all of us and convince us to save our home. 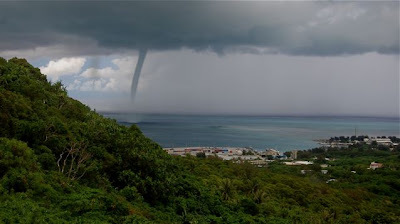 Steve Mckagan, from the NOAA field office here on Saipan, will be on hand to talk about what we are doing locally to prepare for climate change and how the local community can get involved with some of those programs. As always, First Friday Films is free and open to the public. Seated is limited, so please arrive early to ensure admittance. Grassroots organizations involved in coastal and marine conservation are invited to participate in UNEP/GRID-Arendal’s Blue Carbon Photography Contest. Selected photographs are intended for use in a special publication for the United Nations Climate Change Conference in Durban, South Africa (COP17), and for an online image resource - the Blue Carbon Photography Library. The theme of the contest “Life on the coasts - Blue Carbon” focuses on the importance of a healthy marine environment in coastal livelihoods. We are looking for iconic images in two categories – People & the Environment, and Coastal & Marine Ecosystems. Examples include coastal and underwater scenes, community based restoration and conservation projects, our connection to healthy coastal ecosystems (e.g. fisheries, tourism), and how a changing ocean and climate impact the daily life of people and communities living along the coast. As long as there is a clear affiliation with a grassroots organization, all professional and non-professional photographers worldwide are welcome to submit. Organization logos will also be highlighted in the special publication. Blue Climate Solutions has offered a digital underwater camera as a prize for the best image. Additional sponsors are welcome. **The DEADLINE for submitting pictures to UNEP/GRID-Arendal is SEPTEMBER 30, 2011. Finalists will be announced in October 2011. Personal Release forms are required for all images that include recognizable subjects and children (see Competition Rules). After reviewing the following Competition Rules, you will be fully prepared to enter the contest. UNEP/GRID-Arendal is a non-profit, administratively independent institution and an official collaborating centre of the United Nations Environment Programme (UNEP). It was established in 1989 by the Norwegian Ministry of Environment to support UN’s Environment Programme and other UN agencies. Its mission is to communicate environmental information to policy-makers and facilitate environmental decision-making for change. This to kindly inform dog owners starting next week July 11th-22nd 2011 Mayor of Saipan will reopen its Dog Control Program "Dog Tag License Registration". Registration will take place at the Mayor of Saipan Compound at Chalan Kanoa (behind the Post Service Office) from 9:00am-4:00pm(open during lunch hours). Please be advised to pay your fees at the CNMI Treasury in Capitol Hill, Superior Court in Susupe or the Tax and Revenue in Dan Dan then proceed to the registration site. Applications are available at the cashiers, please fill out the application per dog so we can expedite the process and then we will issue the tags. 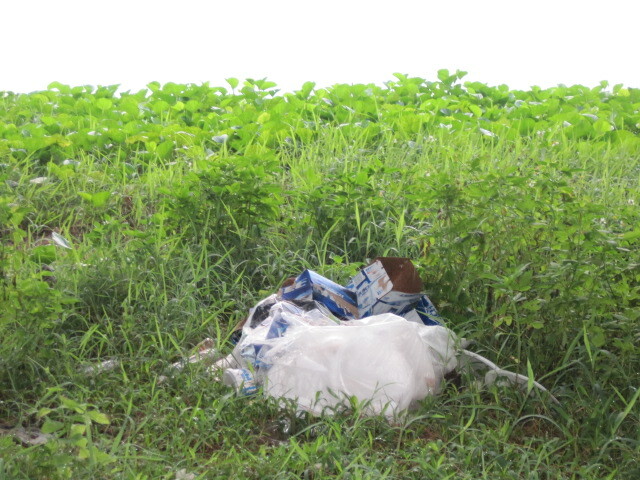 To see a copy of Saipan Local Law 9-12 Dog Control Act and its Regulations, please contact the Mayor's office. Thank you for outmost support for the program. Tomorrow First Friday Films will be presenting A Sea Change, a film that tackles the twin of global warming, ocean acidification, and its effects to our ocean, our corals, and our marine animals. The event starts at 6:30pm at the American Memorial Park visitors center. 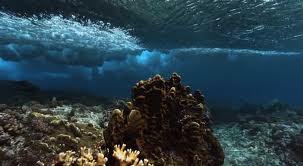 If you live in an island, like ours, that heavily depends on coral reefs for tourism and sea creatures for sustenance, wouldn’t you want to know what is happening to them now and what might happen to them in the future? Sven Huseby, an ordinary grandfather, wants to know. 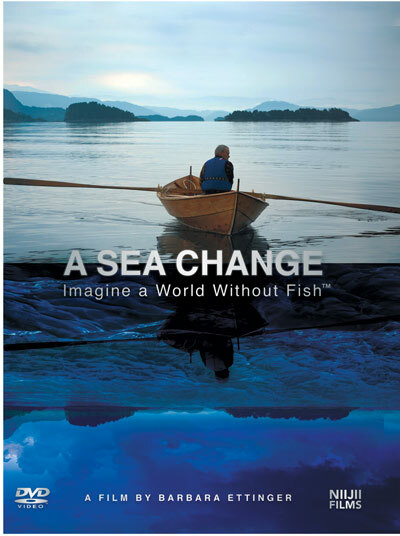 Recipient of the 2010 National Oceanic and Atmospheric Administration (NOAA) Environmental Hero Award, A Sea Change follows the journey of Sven as he travels from Alaska to Norway to uncover that the global ocean is slowly becoming too acidic for the creatures that live in it. Members of the CNMI Marine Monitoring Team will be on hand to discuss how you can help protect our corals from the expected effects of global climate change. The Pacific Historic Parks (formerly the Arizona Memorial Museum Association) Bookstore, located inside the visitor’s center, will be open until 8:30 PM. All proceeds go to community education programs. As always, First Friday Films is free and open to the public. For planning purposes, the movie runs 1 hour and 23 minutes long. For more information visit the programs blog at firstfridayfilms.blogspot.com. Check out what Kathy Pagapular's 6th grade class at San Vicente Elementary School were able to accomplish with the help of Sharkwater's Rob Stewart and some other very dedicated adults. I hope this inspiring video goes viral, and I'd appreciate anything you can do to put it in the blogosphere, Twittersphere, or Facebooksphere. How about becoming an Ocean Hero? Be an Ocean Hero This Summer! World Oceans Day, June 8, is a day for celebrating the oceans' beauty and bounty. This summer, do more than just celebrate. Be an ocean hero. CLICK HERE: Bing an ocean hero is easy – just pledge to recycle, clean up or eat sustainable seafood this summer. The IUCN Red List Threatened Species assesses the Oceanic Whitetip Shark as Critically Endangered in the Western and Central Atlantic. Globally they are assessed as Vulnerable and are threatened with extinction if strong measures are not put into place to protect their remaining populations. 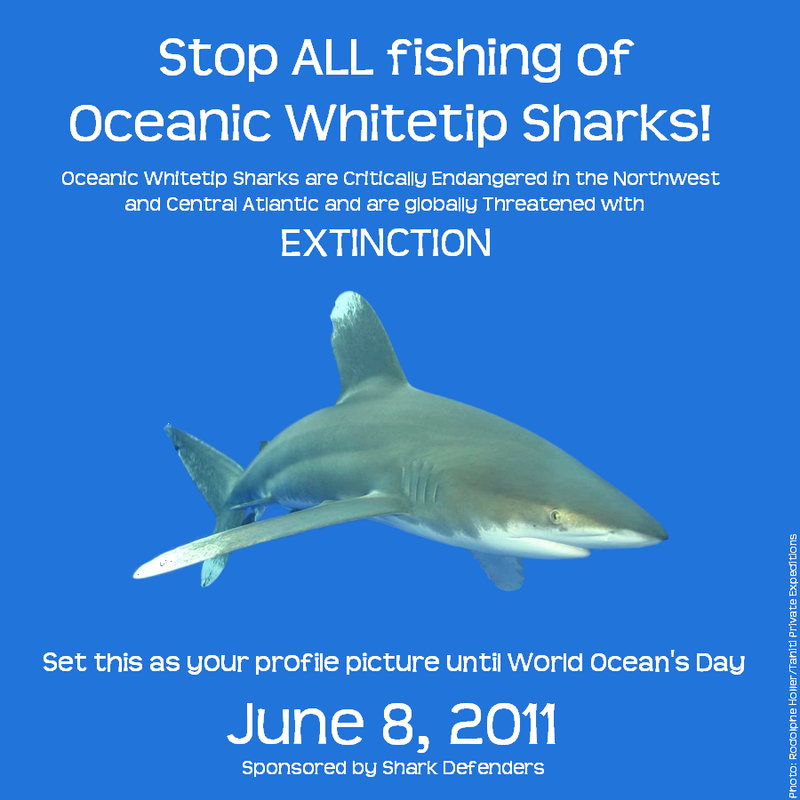 To raise awareness of the plight of this charismatic species, please change your Facebook profile picture to the attached graphic until World Ocean's Day on June 8, 2011. A high resolution of the photo can also be found on Flickr. As many of you know by now, on May 2, 2011 Judge Kenneth Govendo issued a 90-day preliminary injunction on the Marpi power pole project following two days of hearings on the matter. The judge encouraged the government and the Friends of Marpi to come together over the 90-day injunction period and discuss ways to resolve the controversy that would be satisfactory to both parties. Letter from Dr. David Louter, Cultural Resources Program Chief for the National Parks Service, in response to to Friends of Marpi's inquiry regarding the compliance of the Marpi power pole project with requirements under Section 106 of the National Historic Preservation Act (document attached). Dr. Louter describes the significance of the National Historic Landmark area of Marpi, and the role of the National Park Service in monitoring historic sites across the nation. He notes that NPS is concerned about the cumulative effects, or incremental loss, that the Marpi cemetery and other projects may have on the integrity of the Marpi area and its historic and cultural values. Louter further indicates that NPS had not been formally invited to Section 106 consultation for the Marpi project, and that NPS had supported the CNMI Historic Preservation Office's recommendation to the local government to consider either solar power or underground lines instead of power poles. A document produced by the Public Service Commission of Wisconsin, titled "Environmental Impacts of Transmission Lines" and found here: http://psc.wi.gov/thelibrary/publications/electric/electric10.pdf. The paper provides an overview of the environmental issues and concerns raised by the construction of power lines, and discusses ways to measure, identify, and minimize or mitigate negative impacts, including impacts to places of historic, cultural, or scenic value. The paper also notes that underground transmission lines are considered a reasonable alternative in places where aesthetic impacts of power lines would be significant, and that low-voltage underground lines are more cost-effective and more common than high-voltage underground lines. Many thanks to Jim Davies, a resident of the CNMI for more than 20 years, who offered testimony at the hearing about the impacts that the Marpi power poles will have on his ecotourism business, and CNMI ecotourism generally, and also on the Japanese film and photography industry, with which he has worked over the course of his years here, and of course to David Banes and Wes Bogdan for their strong work in preparing the case and securing the injunction. Since the issuance of the injunction, the CNMI House of Representatives, Standing Committee on Natural Resources has called for public hearings on the Marpi power pole project. Please do take the time to make your voice heard and participate in these hearings. Our thanks to House Natural Resources Chair, Representative Joe Palacios, for convening these hearings and offering the opportunity for all of us in the community to express our views. 1. Go to: http://www.friendsofmarpi.com and click on Letter to Elected Officials to sign the form letter which will be forwarded to our elected officials. This will only take you a minute! 2. Write a personal testimony and submit it to the House Natural Resources Committee. Submit written testimonies by dropping them off or faxing to the Office of Representative Joseph M. Palacios (664-8831) or mailing to P.O. Box 500586 Saipan, MP 96950. Written testimonies can also be emailed to rep.palaciosj@cnmileg.gov.mp. 3. 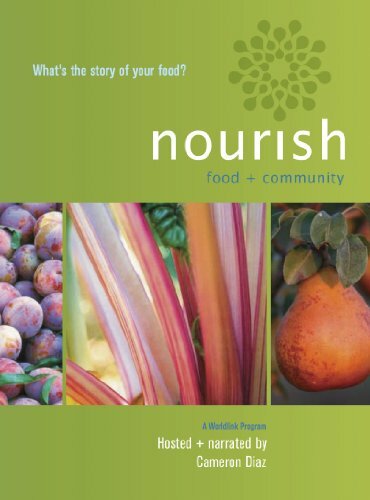 Share your personal testimony with local media and the Friends of Marpi. Email the Marianas Variety at editor@mvariety.com and the Saipan Tribune at editor@saipantribune.com to submit letters to the editor. Please also share your testimonies with the Friends of Marpi - email Glen Hunter at glenhunter@gmail.com so we can post it on the website. 4. Attend the hearings on May 12 (6pm, CNMI House of Representatives Chamber) and May 18 (6pm, Multipurpose Center), and personally submit your testimony at the hearing. 5. Write to David at davidgbanes@gmail.com if you would like your name to be included with his written testimony on behalf of Friends of Marpi. David sent out his draft in an earlier email, and I am attaching it here as well. 6. Sign the petition: http://www.thepetitionsite.com/1/keep-marpi-beautiful-----for-tourists-and-residents-alike/. 8. SPREAD THE WORD. Please circulate this information to your mailing lists, on your Facebook page, and by word of mouth. Encourage your friends and family to join the Friends of Marpi and help keep Marpi beautiful. 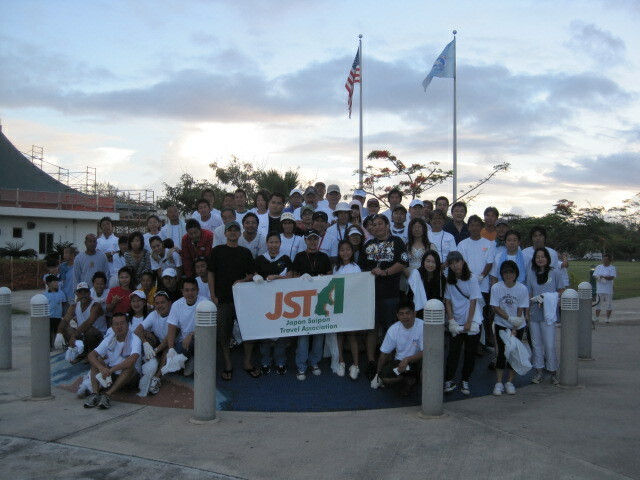 JSTA (Japan Saipan Travel Association) Clean-up Drive is spearheaded by President, Masanori Takahasi. 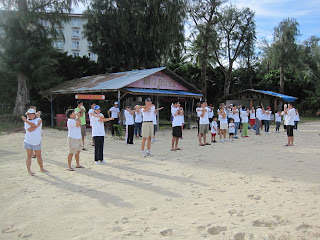 It’s an annual event done every April, in which Fiesta Resort & Spa and Saipan Grand Hotel have participated each year. 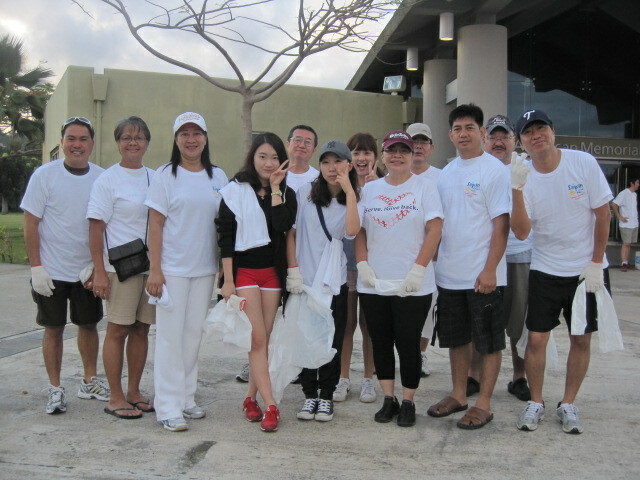 Members get together to assist and support the association in keeping our islands clean and beautiful not only for our vacation visitors but also for our community. 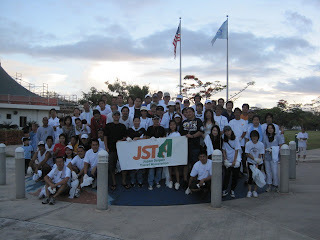 This year, according to Ed Diaz, MVA teamed up with JSTA by providing t-shirts and water station to all participants. The cleanup site was from Micro beach to Chamolinian Cultural Village along the beach side and town side including side streets and Paseo de Marianas. 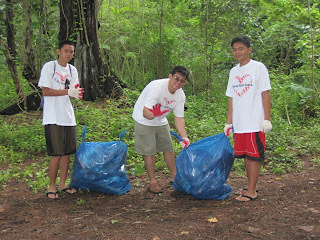 All trash bags were collected at the end of the clean-up. for their dedication to helping keep our island clean and beautiful!